Piece uses felted knitting cut into ‘worms’, silk hankies, dyed merino locks, neps, green dress net and hand dyed merino tops. Piece uses hand-dyed silk hankies felted into several different merino colours to make cut shape pre-felts, then further felted into coloured merino tops. 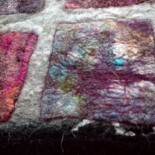 Piece uses hand-dyed silk hankies felted into coloured merino tops then cut and used as pre-felt; then further felted, with gauzy ribbon, into merino tops. Piece uses gauzy ribbon, scrim and small pieces of silk hanky felted into natural Jacob wool tops.